Dehydration is due to a loss of water. The solute concentration in extracellular fluid increases-that is, tissue fluid becomes hypertonic to cells, and water leaves the cells. Common causes of dehydration are excessive sweating, perhaps during exercise, without any replacement of the water lost. Dehydration can also be a side effect of any illness that causes prolonged vomiting or diarrhea. The signs of moderate dehydration are a dry mouth, sunken eyes, and skin that will not bounce back after light pinching. If dehydration becomes severe, the pulse and breathing rate are rapid, the hands and feet are cold, and the lips are blue. Although dehydration leads to weight loss, it is never a good idea to dehydrate on purpose for this reason. To cure dehydration, intake of a low-sodium solution is needed because water intake alone could lead to water intoxication. Water intoxication is due to a gain in water. The solute concentration in extracellular fluid decreases-that is, tissue fluid becomes hypotonic to the cells, and water enters the cells. Water intoxication is not nearly as common in adults as is dehydration. One cause can be the intake of too much water during a marathon race. Marathoners who collapse and have nausea and vomiting after a race are probably not suffering from a heart attack, but they may be suffering from water intoxication, which can lead to pulmonary edema and swelling in the brain. The cure, an intravenous solution containing high amounts of sodium, is the opposite of that for dehydration. Therefore, it is important that physicians be able to diagnose water intoxication in athletes who have had an opportunity to drink fluids for the past several hours. Figure 3A Dehydration versus water intoxication. a. 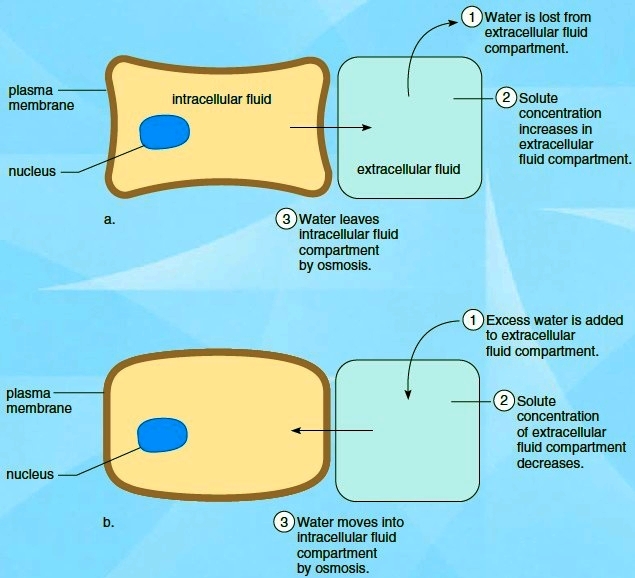 If extracellular fluid loses much water, cells lose water by osmosis, and become dehydrated. b. If extracellular fluid gains water, cells gain water by osmosis, and water intoxication occurs.